Roslyn, WA—After one of the worst fire seasons in recent memory in the Pacific Northwest this summer—with the unforgettable smoke-pocalypse that socked in the region with thick smoke for weeks—a new tool is being added fight against wildfires: goats. 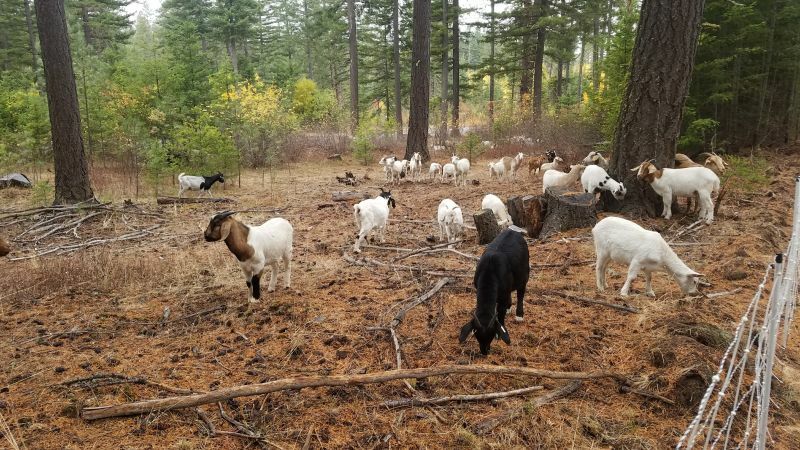 “More and more, people are looking at goats as a tool for fire suppression,” said Craig Madsen of Healing Hooves, a company based in Edwall, Washington, that maintains a herd of about 250 goats that are used for natural vegetation management. The goats bleated loudly and walked towards Madsen as we approached the plot of land where the herd was busy grazing. “The goats are complaining because of the rain,” Madsen said, as a cool, fall shower began. Madsen stood under the overhang of the trailer he uses to transport the herd, across the road from the land where the goats were grazing. The guard dog, Gigi, sat under a tree keeping watch as the goats—bucks, does, and kids—worked together to devour everything within reach.